The Wiikey fusion is a device that allows a Wii to boot games from an SD card. For the Wii, it is a plug and play device (if you can open the Wii) that replaces the disc drive and can work with any SD card. It has since been continued, however an exact clone chip called the Wasp Fusion is still on the market. Interestingly, the Gamecube has a disc drive that follows extremely similar communication protocols as the Wii and thus, this Wiikey device can also be used on the Gamecube, provided that you want to permanently detach the disc drive and solder the Wiikey connections to the main board. This guide will outline the method to connect the Wiikey directly to the Gamecube motherboard. I also cover how I spray painted my Gamecube, although you can probably deduce what I did from the pictures. The following steps will take you through the process which will allow you to boot games from any SD card connected to the Wasp Fusion chip. You will need to know how to solder on relatively small pads. I do not suggest that beginners attempt this. There are already many guides to do this, but it is a relatively simple process. On the bottom of the cube there are 4 screws that you must use the security bit to remove. After doing so, the whole lid assembly can be removed, and the covers for the controller ports and power/display ports should come off easily as well. Afterwards, there are some screws that you can remove with a Phillips screwdriver. You will need one small screw driver to remove some screws near the memory card ports, it might also come in handy when removing the heat sink. Basically you want to be able to hold the motherboard without any parts that can be easily removed. At the end, the motherboard should look like the picture on the right. Note that there are multiple revisions of the Gamecube that may look slightly different. Enclosed in the red square is the DVD port. Use pliers to remove this, by flexing it left and right until the plastic breaks off. There are barbs that may prevent you from removing the plastic fully; just snip them off with your wire cutters. At this point, you can desolder the connectors. Don't worry if you can't get all of them+, but removing them now makes it easier later. In my opinion, the easiest thing to do is to insert the FFC into the NHD-FFC36 board and make sure that the FFC is in the right place first. I do not know of a standard 32 pin FFC breakout board and therefore am using this 36 pin one that was suggest in a forum. Check the connectivity of the right most pin (from the diagram to the right), if it works, its safe to assume that all the other pins are in place. Now all that there is to do is to wire directly to the motherboard. Following the circuit schematic on the right, the view is from the top of the board with the memory card ports pointing towards you (or downwards on this page). The diagram to the right is not mine and was taken from the ModRetro forum. In my opinion, it is convenient to harvest the Gamecube switch for the lid open/close so you can use the actual buttons on the cube for booting. Also, I found it easy to add solder to the pads on the motherboard first before trying to solder connections between the breakout and the motherboard. The 3.43V pin can be connected to the 3.3V power supply on the GC motherboard directly. Although there are many locations with 3.3V I found it easiest to connect to the bottom of the board. A picture of where the power connection is made can be found here. Do test the voltage before you hook this up! 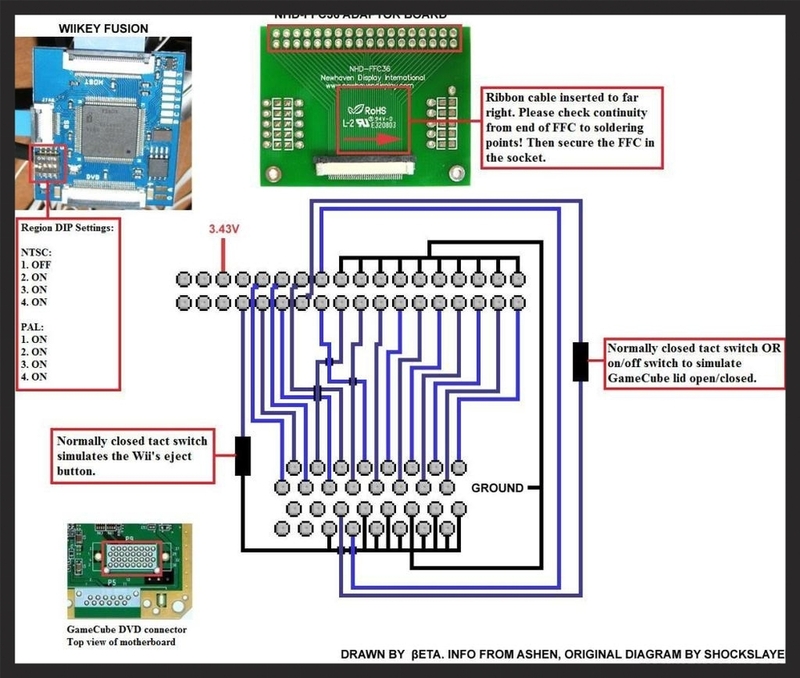 At this point if the breakout is soldered to the motherboard, you can simply connect the FFC from the breakout to the "HOST" connection on the Wiikey. Then connect the smaller FFC to the SD card adapter. You should also set the "Region DIP" switches on the Wiikey fusion to NTSC if you are in Canada or the USA. Use the previous diagram for reference click here for a picture. Now you're ready to test the Wasp Fusion. You may download the Wasp Fusion update here. If you're Canadian like me, just use the USA version; at the time of writing, the firmware version is 1.5 and so far I haven't experienced any operating issues. The tutorial that describes the update process can be found here. Note that you navigate the menu with the d-pad with a controller plugged into port 1. If everything went well, adding games is very similar to the Updating process, except now we burn ISO files to the SD. This process is also described on the same site and can be found here. You should now be able to restart the Gamecube, and boot into the launcher, navigate to the game of choice and press A to load it. Congrats! now you can put the cube back together and just leave the SD card accessible. Looks matter. A hell lot. That's why I took the extra time to paint my Gamecube :). In a few easy steps, you can make your Gamecube look cool as well with the Hylian symbol (assuming you have a gray cube like me)! The first easy thing to do is to paint the port covers on the Gamecube. Since they should be removed from the SD Boot process, literally just put them on some newspaper and spray blue paint on them. Do keep a steady moving hand whilst spraying. Never ever start spraying with your hand stationary otherwise the paint will be extremely thick in a localized area. Unscrew the handle and lid from the main body. Take note of how the lid mechanism goes together, it can be tricky. Now use masking tape to mask off every part higher than the top of the controller ports on the main body. Spray this part blue. If you didn't remove them from the main body, you can do so now. Mask off the edges of the cylindrical buttons with masking tape, only exposing the top. Spray yellow paint on the buttons. The reason the sides of the buttons are not sprayed is to ensure the paint does not jam the buttons. The hardest part. Spray paint on a previous layer of spray paint can crack if air bubbles form on the surface. This can be for a variety of reasons, generally speaking make sure you are spraying in a room with moderate temperature, and that the surface is clean. First spray the whole lid blue. I waited a full day for it to dry, then cleaned the surface with some water. Afterwards, I printed a stencil, which can be found here, and cut out the symbol in the middle with an exacto-knife. Make sure the scale is set appropriately. I then proceeded to glue the stencil to the surface of the lid with a glue stick. This acted as a seal for the spray paint, so that no leaks occured. After that, just mask everything off with paper and tape! Now just wait for things to dry, put it all back together and you're done!